This 6 x 6 layout was inspired by my boys. Most of my scrapping is of them so, naturally, it will have a masculine theme. I love the rustic look and this color combo was perfect. Of course, I picked it straight out of Stampin' Up! 's Outlaw Designer Series paper (long since retired). I aged the edges by sponging on some chocolate chip ink. The chipboard medallion was sponged with Really Rust and layered onto a fussy cut piece of DSP. I added texture to the edge of the Really Rust strip by using my Crop-A-Dile to emboss the circles. 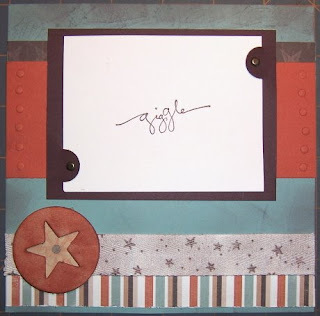 The Twill Tape was given a chocolate chip sponge treatment and then stamped with the stars. 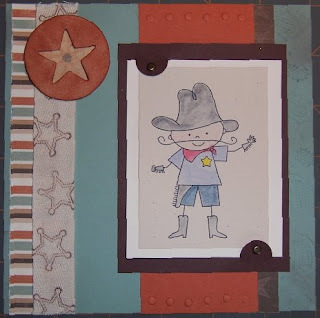 The cowboy was colored using Watercolor Crayons and an Aqua Painter. This next page is the same layout only turned 90 degress. Because they both use the same elements, they look great standing side by side each other in the scrapbook. Tip: What do I mean when I say "fussy cut"? Fussy cut is when you cut your paper so that just a certain portion of it is used. You may want a large flower to be center on your card, you would 'fussy cut' the paper to accomodate. In this case, I wanted the star on the DSP to line up exactly behind the die-cut chipboard star. Thanks for stopping by today. I hope you took a moment to stop and say a prayer of thanks for those service men and women who have and are giving of themselves for our country's freedom. I hope you had a great weekend!